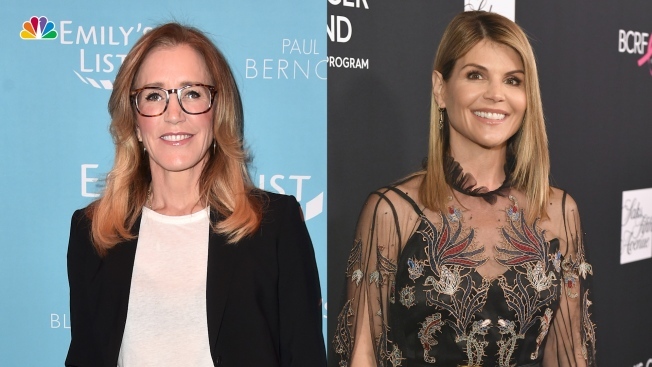 When news broke Tuesday of an alleged nationwide college entrance exam cheating scandal that ended in the arrest of at least 50 individuals, two names that jumped out to the general populace were Felicity Huffman and Lori Loughlin. Here's how you know them. Huffman, married to "Shameless" star William H. Macy, has been a television and film actress for decades. She was nominated for an Academy Award for her role in the 2006 film "TransAmerica" where she portrayed a preoperative transgender woman who learns she fathered a son. She's also a Golden Globe nominee for her work on American Crime," and "Desperate Housewives." Court documents said Huffman paid $15,000 that she disguised as a charitable donation so that her daughter could take part in the college entrance cheating scam. The FBI says Huffman coordinated by e-mail with the cooperating witness. In a separate instances involving her other daughter, Huffman in a call recorded by investigators on Feb. 19 allegedly raised concerns her daughter would take the test in March of this year and then would have a scoring jump when someone else would later take the test. Ultimately, the FBI says in court documents that Huffman and her spouse decided not to pursue the SAT cheating scheme for that daughter. Late Tuesday, a judge said Huffman could be released on a $250,000 bond. Loughlin is known to a legion of "Full House" and "Fuller House" fans as Aunt Becky. Among her other acting credits are the now defunct soap opera "The Edge of Night, and "90210." In Loughlin's case, investigators says she told the cooperating witness that they would get a picture of their daughter to support her application that she, falsely, was a member of the crew for the L.A. Marina Club team, as part of an application to USC. The FBI also says on a recorded call Loughlin told the cooperating witness that if the IRS called she would just say that she gave an admissions consultant a donation and would not mention that they helped get her daughter into USC. Both women are charged with conspiracy to commit mail fraud and wire fraud. The documents, which were unsealed Tuesday morning, allege that the accused aimed to facilitate students getting into high-profile D-1 schools, including Georgetown, Stanford, UCLA, Yale, University of Texas, University of San Diego, University of Southern California and Wake Forest as recruited athletes regardless of their athletic ability. "These parents are a catalog of wealth and privilege," U.S. Attorney Andrew Lelling said in announcing the $25 million federal bribery case. Court papers said a cooperating witness met with Huffman and her husband at their Los Angeles home and explained the scam to them. The cooperator told investigators that Huffman and her spouse "agreed to the plan." In a January interview with Parade, Macy spoke about the stressful college preparation process for their daughters. Loughlin is currently inbound to Los Angeles on a flight and is expected to surrender to Federal officials in Los Angeles Tuesday afternoon.